A sacred program focused on love is certainly intriguing, and it proves entirely worthwhile. 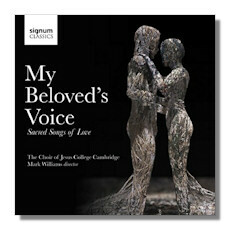 This is so far, my choral disc of the year for 2014, Not only are the choirs of Jesus College Cambridge uniformly excellent in their 19 selections, but they daringly chart a course over nearly 500 years of music. And what a choral program at Jesus College! Just when I thought I could ignore British choirs until Advent, along comes this stunningly resonant – but amazingly clear – disc from Signum Classics. Dynamic, blended, and musically involved, the diction is actually comprehensible despite the acoustics. There are two choirs at Jesus College, both wonderful. The Chapel Choir is all boys. There are both men and women in the College Choir, founded as late as 1982. In English and Latin, these forces shine in whatever combination the music requires. Better yet, there is none of that stereotypically English stuffiness that occasionally bogs down choral albums from the UK. There is real emotion in this program, an easily discernable joy in singing these pieces that proves utterly engaging. Mixing contemporary settings with choral classics proves inspired, although my ears found only the Wesley and Duruflé truly familiar. Elsewhere, the music ranges effortlessly from Grieg to Walton, each piece given exceptional care and concern for phrasing and text. The first and second sections of the program are sensibly split with a Vierne organ piece, but you can frankly sit down and absorb the entire hour-long program without any fatigue. I must confess that listening to exclusively trebles for a long period is like doing the same with flute; I can't. So the ever shifting mix of voices not only contrasts the sound of the choral scorings, but makes it easier to appreciate the varied ways in which different composers have set the same texts within this program. The way that William Walton harks back to English choral tradition with Set me as a seal couldn't be more stylistically different that Nico Muhly's very modern and meditative version. Both are moving in their own way. Likewise, Healey Willan's direct and motet-like Rise up my love contrasts markedly with Howard Skempton's own take, that feels a little like John Rutter (no shame in that). Duruflé's Ubi Caritas has rarely sounded so transparent, while Casals provides an unexpected treat for the choir's treble voices. I was amazed that the great cellist had written choral music in an earlier review; to know there is more to discover is a joy. I was even moved by Blessed be the God & Father, so lovingly sung as here. It not only ends the program with nod to a great tradition, but you can actually sing along, so clear are the words. Should you need them, texts are included.